● The climate of West Africa has been observed to be changing in recent decades, with some of these changes clearly attributable to climate change. Regional climate projections show that there is a high level of confidence that temperatures will increase in the region, but there is little consensus on the direction and magnitude of potential changes in rainfall, with a high variability between projections. These changes are expected to have significant impacts on ecosystem services such as carbon storage. ● Biodiversity and protected areas are being affected by climate change and some protected areas are more vulnerable than others to its impacts. A significant number of West African species (including amphibians, birds, freshwater fish, mammals and reptiles) have been identified as being vulnerable to climate change based on their specific biological traits. Of these species, those that have been assessed as globally threatened should be considered priorities for conservation. A large proportion of amphibian, bird and mammal species are expected to be found in areas of lower climate suitability by the end of the century, and a high species turnover is expected in most protected areas of the region, especially in the Guinean Forest region. ● Protected area management should be improved in order to enhance the resilience of protected areas to climate change. Protected areas in West Africa are indeed facing a number of anthropogenic threats. It is therefore crucial to first improve the management effectiveness of existing PAs to give them a better chance to be able to cope with climate change impacts. For species identified as vulnerable to climate change, specific management options are to facilitate their dispersal and to identify sites of suitable climate persisting within their current ranges. In addition, in order to fully protect all essential conservation features of the region, it is recommended that existing PA networks are extended. 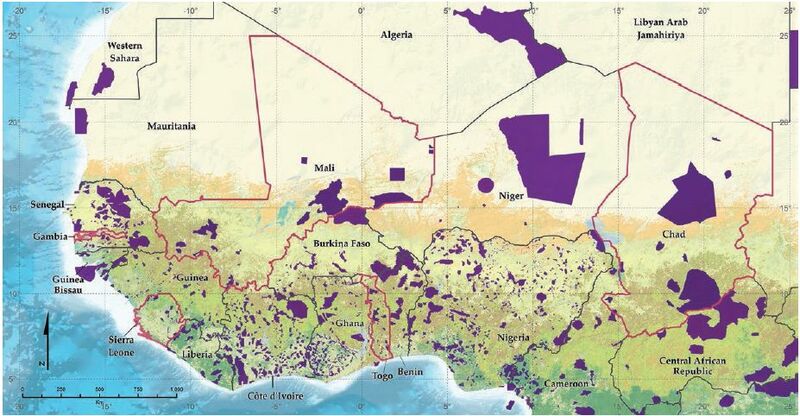 Protected areas in West Africa. Project countries are indicated with red borders. PARCC West Africa, officially known as 'Evolution of protected area systems with regard to climate change in the West Africa region' is a full-size GEF project focusing on the impacts of climate change on protected areas (PAs), which was implemented from 2010 to 2015. The United Nations Environment Programme (UNEP) was the implementing agency and UNEP World Conservation Monitoring Centre (UNEP-WCMC) was the executing agency, working in collaboration with IUCN West and Central Africa Programme (IUCN PACO). The project focused on five core countries in West Africa: Chad, Gambia, Mali, Sierra Leone, and Togo. An additional three countries (Burkina Faso, Côte d'Ivoire and Ghana) were involved in regional training workshops and some of the activities at the transboundary pilot sites. However, all technical elements of the project (such as the climate projections, vulnerability assessments and conservation planning systems) were completed at the regional scale, covering the entire West African region. The main objective of the project was to develop strategies and tools to increase the resilience of PAs to climate change, and build capacity in the region to implement these new approaches. In the project, we define resilience of protected areas as their ability to cope with climate change impacts in ways that maintain their essential functions and capacity for adaptation. A key aspect of protected area resilience is the capacity to retain biodiversity, which in this project was assessed in terms of the expected turnover of species in the future, taking into account both species biological traits and spatial distributions. To conduct these analyses and achieve its objectives, the project required continuous support and engagement from all national, regional, and international partners. After developing new regional climate projections for West Africa, the vulnerability of species and PAs to climate change was assessed through two complementary methodologies which were subsequently integrated: Species Distribution Models (SDM) and Traits-based Vulnerability Assessments (TVA). An analysis of the connectivity of the West African PA network also highlighted the importance of specific PAs and links between PAs. Based on these findings, systematic conservation planning systems were developed at the national and regional level to help inform conservation priorities in the design of new PAs, both for the countries and for regional bodies such as the Economic Community of West African States (ECOWAS). Studies on the links between PAs, communities and climate change, and of available options for managing and financing PAs to adapt to climate change were also carried out. Based on the scientific outputs mentioned above, five transboundary pilot sites were selected and activities on the ground implemented.These activities included recommendations for species monitoring and for designing or revising transboundary management plans that consider climate change, as well as the development of a new Management Effectiveness Tracking Tool (METT) integrating climate change aspects. Importantly, capacity building took place at multiple levels throughout the project lifespan, primarily through national and regional training workshops. Finally, adaptation strategies and policy recommendations were developed for climate adaptation and management at the national and regional level, as well as guidelines for managers of individual PAs in the face of climate change. Furthermore, the results of the PARCC project have been integrated into the Protected Planet website, the web interface of the World Database on Protected Areas (WDPA), allowing access to all project outputs and to the results of the vulnerability assessments for each individual West African protected area (http://parcc.protectedplanet.net/sites). The project thus generated improved information on the effects of climate change on biodiversity and PAs, thereby allowing a better understanding of how to better manage protected areas, especially transboundary PAs, in the face of climate change.